I’m usually the type of person who tries to do what’s asked of me by public signs. I figure that the person or organisation responsible for the sign has given their request some thought. I hope that there’s a good reason behind the request and that I can contribute to the public good by doing what’s asked. At this bus station exit, there are two choices: the lift, or a steep flight of stairs. Several times each week, I arrive at the bus station with a suitcase full of training materials. Does this make me a person with ‘limited mobility’? Does my suitcase qualify as ‘goods’? 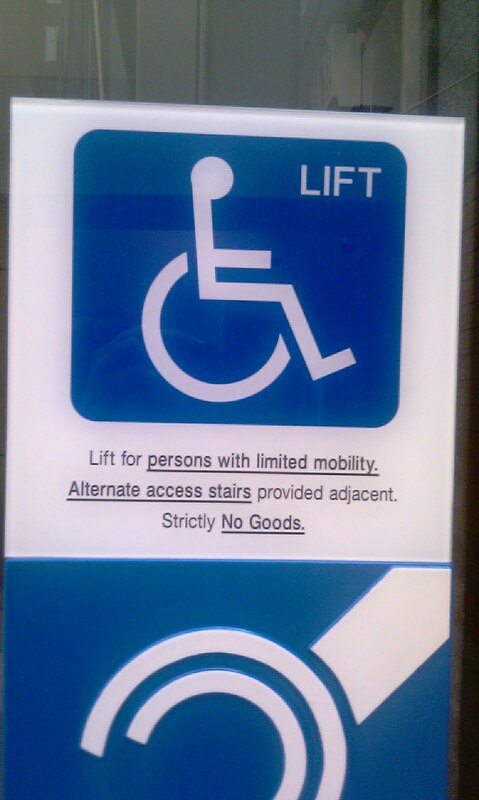 Am I, therefore, entitled to use this lift or not? I do use the lift, because I don’t want to carry the suitcase up the stairs, and I don’t want to walk to the opposite end of the bus station to use the escalator. But every time I use the lift, I experience the same tension. What if I’m breaking the ‘rules’? What if this sign really does apply to me? What if, one day, some ‘rule monitor’ tells me that I’ve got it wrong and I’m not supposed to be using the lift? A trivial example, maybe. But it’s an example of a tension that shouldn’t need to exist. Why is the sign needed? And why should people like me – who are perfectly able bodied but are carrying ‘goods’ that make the stairs difficult to use – be prevented from using the lift? If I ignore this sign because it makes no sense to me, does it encourage me to ignore the next sign that I come across?